Some Muslims believe that wherever the Prophet Muhammad roamed, his left foot made a lasting impression. Such footprints have been recovered from religious sites throughout the Middle East and are now on display at mosques, museums and other historical sites throughout the region. 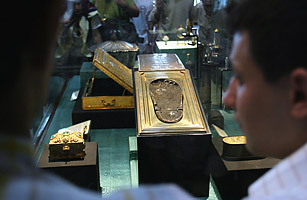 One such print found its way to the Topkapi Palace Museum in Istanbul, where it is displayed today.